The path of an exile. From sand mages to precise blade-legs, each of League’s 136 champions started somewhere. This is Riven’s story. These days, new champions are released every couple months—with six new challengers approaching in 2016—but 2011 was a different story. Back then, new champions hit the Rift (almost) every patch. 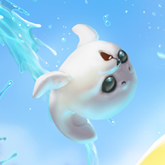 Our goal then was to expand the game by aggressively adding new champs to League’s roster, and the entire development process usually took under six weeks from concept to launch. A lot of early Demacian characters fell into that cookie-cutter mold, and it was starting to seem like the region was full of perfectly moral citizens (which is fine, until everyone is like that). In an attempt to show that Demacians are more than just lawful ninnies, devs set out to make a Demacian champion with a wild side. Around the same time, Xypherous designed a three-part melee ability that led to sick combos (now fondly known as Riven’s Q). The team set out to create a Demacian fighter who could use this new ability but realized there were already multiple melee brawlers from Demacia (Garen, Jarvan, Xin Zhao). 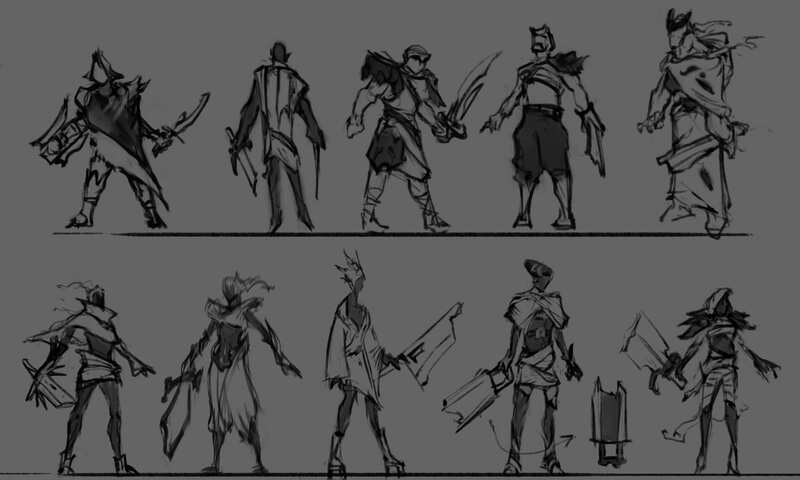 Keeping the same goal of breaking a faction’s typical mold, they shifted to designing a Noxian fighter who could show that not all people from Noxus are insufferably evil. Inspired by the story of a wandering monk in Planescape Torment—whose weapon changed based on his state of mind—Xypherous envisioned a character whose sword was as fractured as her mentality. 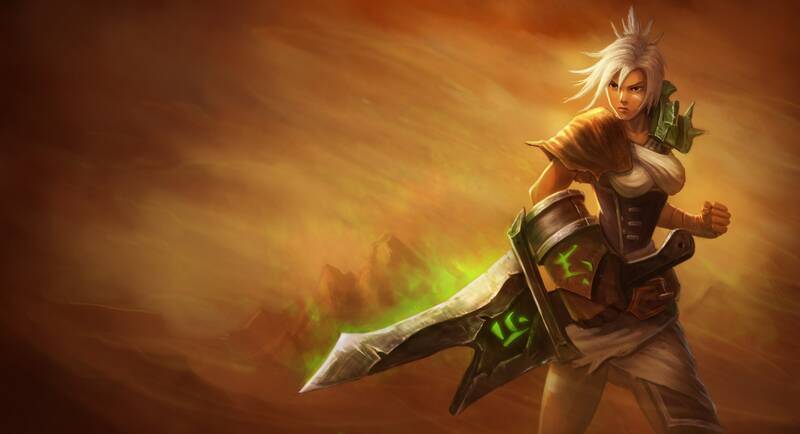 Riven was once a dedicated soldier of Noxus who believed strength (in any form) was the ultimate measure of someone’s worth, but she lost faith in her convictions during the invasion of Ionia, when Singed fired bombs against Noxians and Ionians alike. It caused massive destruction without the need for strength or skill, yet the Noxian leaders still rallied behind the biochemical warfare. “Afterwards, Riven basically said, ‘F- this,’ broke her sword, and deserted Noxus in the hopes of finding herself,” artist Anton “RiotManton” Kolyukh says. 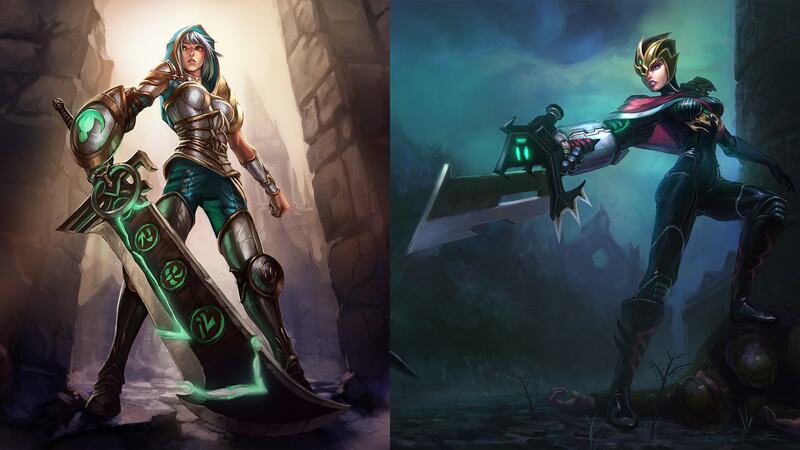 Riven’s two release skins were meant to show two possible outcomes of her wandering: Redeemed Riven forged her own path and became semi-holy, while Crimson Elite Riven returned to Noxus and became a commander. When RiotManton began sketching Riven’s concept art, it was unclear whether the character was going to be a boy or a girl—so he drew both. They ended up going with a female character for two main reasons: 1) Most of the previous champs with melee weapons were males. 2) Many female champions in League were scantily clad and pretty sexualized, so this was a chance to deepen League’s portrayal of female characters. “I was passionate about Riven being a female because she’s a badass and she’s covered up,” RiotManton says. Noxus’ colors weren’t always shades of red and black. Green and purple were once the primary colors of Noxus (Swain, Cassiopeia, Urgot), which is why Riven’s armor and sword are both green. The original Summoner’s Rift was also quite green, so RiotManton moved towards a more teal color palette to make her character pop in-game. Bonus fact: Resources for champion development used to be much more limited. 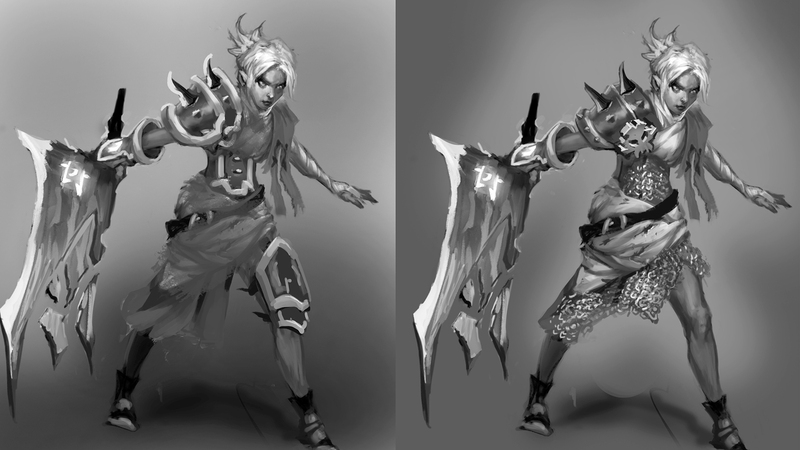 To save time, some of the drawings of Riven’s runes were used as the basis for her VFX, and some of her particle effects were basically copy-pasted textures from concept art. 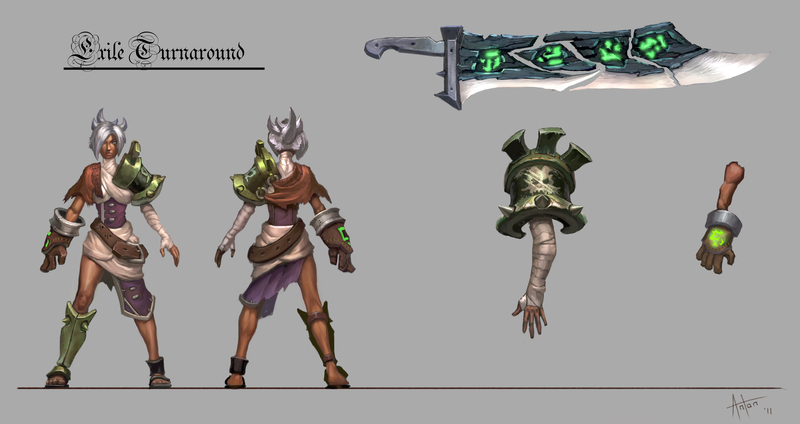 Even in the earliest of concepts, Riven’s shattered sword re-formed during her ultimate. Initially, her runes were going to glow a different color while the outline of her sword appeared, and then *VFOOM,* the blade would become whole again. To really sell this transformation, a good chunk of in-game time was needed for the VFX and animation to take center stage. 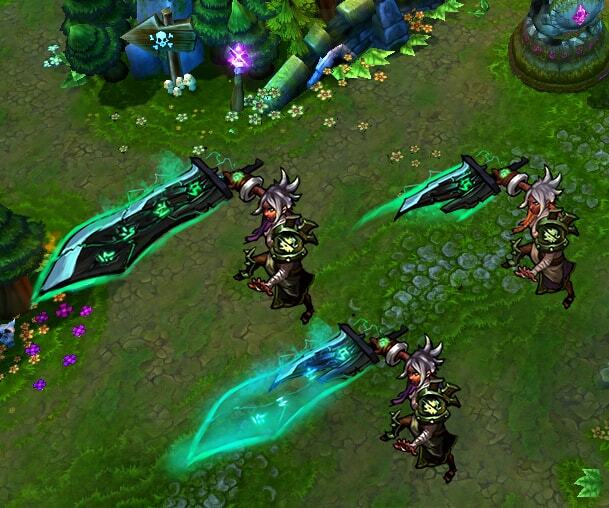 In-game mock-up of Riven’s sword during her ultimate. When it came down to actual gameplay, there was only about half a second for the effects to take place, so the dramatic transformation was scrapped. 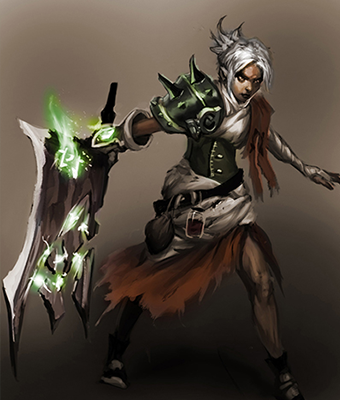 Instead, Riven was given unique voice over lines that only play while Blade of the Exile is activated—the first time this VO tech was used in League. With Riven’s sword restored, it was time to figure out her ult’s gameplay mechanics: What could she do during the transformation, and what could she do after? Stay awhile and listen as we present a list of ults-that-didn’t-make-it, with commentary by Xypherous. Auto-attack cancelling and all, the Noxian exile was ready to duel on the Rift, where she’s since created button-mashing, salt-inducing fun for everyone. ORIGINS is a series where we deep-dive into the development of champions. Feel free to drop some thoughts and feels on the series below and let us know which champs you’re most interested in hearing about!